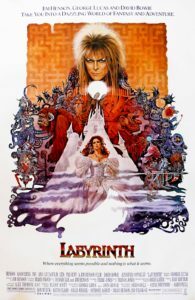 010 – Labyrinth | All Eighties Movies. All The Time! This week Gidgit Von LaRue and Angryman have gone through dangers untold and hardships unnumbered to go beyond the Goblin City and chat about that 1986 classic Labyrinth! This entry was posted in Podcasts and tagged action, fantasy, kids, labyrinth. Bookmark the permalink. I SO want to watch this movie again after hearing this. Have not watched it since I was a young adult but have grand kids now and want to show them this. Thank you. Had no idea about your eighties pod cast and Labyrinth is one of my favorite movies of all time. Got link from You Tube. Can’t wait to let my husband listen to it as he adores this movie as well. Love the Australian accents. Real novelty. Love how you both embraced and love this movie so much. When my 7 r old is old enough we’ll be showing it to her. Thank you for a wonderful pod cast. Best wishes from Lone Tree, Colorado. Got your link from YouTube. Funny hearing ozzie accents but you obviously loved the movie as I do and glad I got the link. Im looking forward to more 80s fantasy films like The Dark Crystal. I have to say thank you for not making the David Bowie character and Sarah character ‘creepy’ As a young man growing up in this era I never thought of it creepy and with three daughters and one son I still do not think it so I’m glad you made that clear as it was a fantasy film and although my ‘young’ self adored Jennifer I was around her same age and never thought Bowie as an older man . Just a fantasy character. I let my girls watch this movie and I appreciate you addressing that issue as a father now 48 and hoping my lust for her was not ‘creepy’. Great pod cast and I’ll be listening to more. Oh wow love this movie and you two do such amazing impersonations. Never heard that on a podcast before. Just wow! I fess up now I’m totally addicted to your podcast. I only have 5 more to listen to and I will have listened to all of them! Such a mega fan! Yes your holidays are different to our vacations. I like how you cleared that up.